That’s right, it is National Hairball Awareness Day! And here is the so-called “celebrity” that my human fashioned out of Boodie’s fur: Cousin It of the Addams Family. 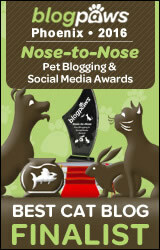 Some of you may have already seen it on the PeoplePets website or the FURminator Facebook gallery. I thought it was a pretty lame attempt at this assignment, and I was not surprised that it did not make it to the finals of the contest FURminator had. Incidentally, Andrea and the Celestial Kitties guessed ZZ Top, which would have been a better idea, except that my human only had one pair of too-small sunglasses and no Stetson hats. She did, however, have enough fur to make the whole band. But anyway, the FURminator humans sent me a new FURminator, but we already have several, so I am giving this one away. It’s meant for small (under 10 lb.) shorthaired cats, but if that does not describe you or you already have a FURminator of your own, don’t worry — you can donate it to your local rescue, which I’m sure would appreciate it. Plus, my human is throwing in a little (read: very little) surprise gift for your human. All I will say is it is cat related and s/he will not have to wear it. I do love the FURminator! I love being brushed in any way, shape or form. Now you can see why my human was having me pose here — she was trying to hide the ratty corner of the rug that was torn up by… Boodie! Maybe she was not impressed with Cousin It either. Anyway, enough of this nonsense. If you want a chance to win this FURminator (for yourself or your local rescue) and whatever it is my human is going to add to the package, just say so in the comments below. You have until 11:59 PM Pacific Time on Sunday, April 29. I will pick a winner at random and announce who it is on Monday. U.S. residents only for this giveaway, since it’s rather small this time around. Iffen I wins miss Sparkle, maybe i could donate my winning Furminator to my pal @ChrisGroove1 on twitter. He’s pawsome and lives in Texas which is in the USA * checks GoogleErf * Yup it is. I have several rescues and could REALLY use this! My two fur babies would greatly benefit from one of these. It’s amazing how much they shed! Pleeeeeaaaase don’t talk about fur balls ! I just came back from the groomer with Kim ! As she hates to be brushed, she was full of knots ! I have never seen such a big furball in my whole life when it was finished. It was sufficient to make furcoats for 3 other cats ! I almost bought a Furminator on Friday! I have 7 furbabies, and one is a Norwegian Forest, so I really could put it to good use! But if my kitties don’t like it, I would donate it.